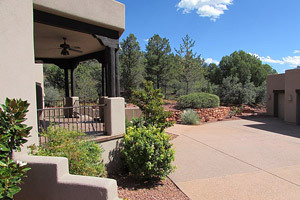 Homeowners in and around Verde Valley, Flagstaff, Lake Montezuma and Munds Park like to ensure that their property looks attractive and appealing. With this in view they opt for the best exterior finishes and hire the services of specialist landscaping companies like Landscape Magic for high quality, creatively designed outdoor spaces. We have also helped a large number of property owners in and around Sedona, Cottonwood, Village of Oak Creek, Cornville and Clarkdale achieve the effect they want on their properties. Over the years, many of our customers have also requested us to handle exterior stucco application projects and we tackle these in an expert manner too. Stucco is an excellent option for coating the exterior and interior walls of the home. No matter which way you look at it, when you opt for our services for stucco application on internal walls of your home, you benefit in a number of ways. You can use this web form to send us your queries or request for a free quote for interior stucco. You can also speak with the Landscape Magic experts at 928-284-9314 and tell us what your requirements are. We handle end-to-end landscaping projects including landscaping and property maintenance, construction of retaining walls and installation of pavers and water features too.